The Texas Tech Red Raiders will play in the NCAA Final Four for the first time in school history. Third-seeded Texas Tech, led by third-year head coach Chris Beard, earned the trip by surprising No. 1 Gonzaga 75-69 Saturday afternoon in the West Regional Finals. As a result, the Red Raiders will play in the NCAA semifinals a week from today in Minneapolis. They’ll take on either Duke or Michigan State, who play Sunday in Washington, D.C., for the East Regional title. In the game played at Anaheim, California, the Red Raiders shut down one of the nation’s most explosive offensive teams with a relentless defensive effort. They held the Bulldogs to 20 points below their average and to 42.4 percent shooting from the field. Texas Tech — Jarrett Culver, 19 points, five rebounds, two assists, three steals. Tariq Owens, 9 points, five blocked shots, seven rebounds. Matt Mooney, 17 points. Davide Moretti, 12. Gonzaga — Rui Hachimura, 22 points, six rebounds. Brandon Clarke, 18 points, 12 rebounds. The UTSA Roadrunners wanted to play all weekend in Frisco, if they could. And, for most of the first half Thursday night, it looked as if they might have the right mojo to make a strong run in the Conference USA basketball tournament. The UAB Blazers had other ideas. Guard Zack Bryant produced 24 points, seven rebounds and five assists as the fifth-seeded Blazers, down by seven at intermission, rallied to eliminate the No. 4 Roadrunners, 85-76, in the tournament quarterfinals. Coming on strong late in the game played at The Star in Frisco, the Blazers shot 50 percent from the field and hit six three-point shots in the second half. As a result, UAB will advance to take on the top-seeded Old Dominion Monarchs in Friday’s semifinals. Jhivvan Jackson led the Roadrunners with 35 points on 9 of 24 shooting from the field. Keaton Wallace shot 5 of 14 from the floor and finished with 12 points. Jackson left the game for a few minutes early in the second half after turning his ankle. It was a key sequence for the Roadrunners, who lost the lead and never recovered. UAB held UTSA to 11 of 33 shooting from the floor after intermission. Jackson came out firing in his first C-USA tournament game. The 6-foot guard from Puerto Rico scored 21 points in the first half as the Roadrunners built a 42-35 lead. Trailing by 12 points early and by 11 on a few more occasions, the Blazers rallied with a Tyreek Scott-Grayson-fueled 6-0 run in the last few minutes. Scott-Grayson hit two shots in the run. UTSA answered with a Giovanni De Nicolao layup with 29 seconds to account for the final points in the half. It’s possible that UTSA could get a bid to either the College Basketball Invitational or the CollegeInsider.com Postseason Tournament. But UTSA coach Steve Henson didn’t say for certain that the team would play again this season. As for the Blazers, they’ll face the Monarchs in Friday’s C-USA semifinals. Old Dominion escaped Louisiana Tech, 57-56, on a three in the final seconds by point guard Ahmad Caver. UTSA was limited at the outset with Nick Allen trying to play on a fractured toe. But things got worse as the game went on, with Atem Bior getting in early foul trouble and then Byron Frohnen and Adrian Rodriguez suffering minor injuries in the second half. Taking advantage in the paint, UAB outrebounded UTSA, 42-30, including 17-9 on the offensive glass. The Southern Miss Golden Eagles knocked down 16 three pointers Saturday and blew out the UTSA Roadrunners 81-48 in the regular-season finale for both teams. Playing at home in Reed Green Coliseum at Hattiesburg, Southern Miss held UTSA to 28.8 percent shooting in handing the Roadrunners their worst loss of the season. Next stop for the Roadrunners is the Conference USA tournament in Frisco. As the No. 4 seed, UTSA will get a first-round bye and will open play next Thursday at 6:30 p.m at The Ford Center. Southern Miss held UTSA’s high-scoring duo of Jhivvan Jackson and Keaton Wallace to a combined 12 points. Wallace scored seven points and Jackson five. The Eagles limited Wallace to 2 of 14 shooting and Jackson to 2 of 15. “Keaton and Jhivvan’s shots were straight-on. Most of ’em straight on, and short. Some of ’em good shots. Some of ’em not. They totally distort what we’re trying to do offensively every time. (Southern Miss coach) Doc (Sadler) does a great job with their switching. Switching and double teaming. You got to be able to find the open guy. They make you make plays.” — UTSA coach Steve Henson. 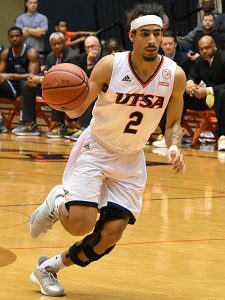 Jhivvan Jackson scored nine of his game-high 29 points in overtime Wednesday night, lifting the UTSA Roadrunners past Western Kentucky 81-76. 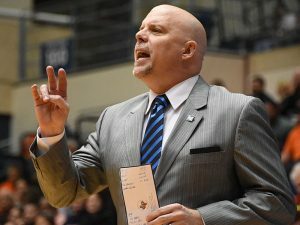 In the game played at Bowling Green, Kentucky, UTSA survived amidst 12 ties and nine lead changes, taking over second place in Conference USA and clinching a bye in next week’s conference tournament. For the Roadrunners, Giovanni De Nicolao scored a surprising 17 on 7 of 10 shooting, while Keaton Wallace added 13. Jackson, the leading scorer in Conference USA, hit 8 of 22 from the field and 4 of 10 from three. Charles Bassey, a 6-foot-11 center who played two seasons at St. Anthony in San Antonio, led the Hilltoppers with 21 points. He also added 11 rebounds and 2 blocked shots. UTSA will close out C-USA regular-season competition Saturday on the road against the Southern Miss Golden Eagles. The C-USA will hold its tournament March 13-16 in Frisco. UTSA played shorthanded in the post against Western Kentucky. Starting forward Nick Allen, who has an injured toe on his right foot, didn’t play. In addition, Atem Bior fouled out and Adrian Rodriguez went to the bench in the second half with a bloody nose. ‘The theme of the game was toughness. I thought our guys fought like crazy. I looked over and we’ve got guys jamming blood-sticks up their nose. (Trainer) Josh (Modica) was working on Adrian (Rodriguez), and Jhivvan needed some tape on his shoulder and Gio was cleaning his own bloody knee. We fought like crazy. I can’t say enough about those guys.’ – UTSA coach Steve Henson told the team’s radio broadcast. With 20 seconds left in regulation, Jackson hit a long three to put UTSA up by one. Western Kentucky’s Lamonte Bearden had a chance to win it but missed the first of two free throws with six seconds left. Jackson, a 6-foot sophomore, scored nine of UTSA’s 13 points in overtime. ‘We just got to give credit to Gio (De Nicolao) in the first half and our bigs. Our bigs played great (against Charles) Bassey. He’s tough to defend. We tried to limit the passes inside, just by really bothering the passes. We did that, and down t he stretch, we just got some stops.’ — UTSA guard Jhivvan Jackson. The eighth-ranked Texas Tech Red Raiders will win at least a share of their first Big 12 basketball title if they can beat Iowa State on the road Saturday. “That’s the plan,” Texas Tech guard Jarrett Culver told ESPN’s Holly Rowe after Monday night’s 70-51 home victory over the Texas Longhorns. The Red Raiders won their eighth straight game with dominant defense, holding the Longhorns to 29.6 percent shooting. Sharp-shooting guard Jase Febres couldn’t get many open looks and finished 1-for-10 from the field, underscoring Texas’ struggles against one of the best defensive teams in the nation. On the other end, the Red Raiders patiently picked apart the Longhorns with 50 percent field goal accuracy. Six different players hit at least one three-pointer for Tech, led by Davide Moretti’s 3 for 3. Culver scored 16, Matt Mooney 15 and Moretti 11 for the Red Raiders, who are tied for first with the Kansas State Wildcats leading into the final weekend. Kansas State beat TCU 64-52 in Fort Worth to keep pace in the race. Kansas State plays at home Saturday in its finale against Oklahoma.